Nanny Poppinz is A 27/43 Company. 27 Years Old and 43 Thousand Happy Families!! Nanny Poppinz of Charlotte, North Carolina is excited to provide customized Nanny childcare solutions 24 hours a day, 7 days a week to our Charlotte area families. Since 1992, Nanny Poppinz has recruited, evaluated and referred the finest quality Nannies to over 43,000 families nationwide. With the opening of your Nanny Poppinz agency in Charlotte, Nanny Poppinz is proud to offer this extraordinary customer service tradition in the Greater Charlotte area. Nanny Poppinz want to help Moms and Dads have successful careers and personal well-being and to do so with the peace of mind that their children are cared for by a well trained, trustworthy, loving Nanny. At Nanny Poppinz, we understand the importance of having a reliable Nanny and refer only the highest quality Nanny to each Charlotte area family. We interview each Nanny face-to-face before any area families meet them. Unlike other area Nanny agencies, you will NEVER pay an application or membership fee. You pay nothing until you hire a Nanny Poppinz Nanny and if you are a Nanny you pay nothing period. We also make sure that each Nanny is prepared in the unlikely event of an emergency in your home. That's why each Nanny Poppinz Nanny is required to take in CPR, First Aid and AED course. Each full or part time Nanny referral is guaranteed for six months after hire. There is NO better company or Nanny Agency guarantee in the Nanny childcare industry. Nanny Poppinz understands the importance of finding the best possible Nanny care for our most treasured gifts, our Charlotte area children. Many families choose a Nanny for flexibility with their schedules, a lower occurrence of childhood illness, customized one-on-one Nanny childcare, and a comfortable and SAFE AT HOME environment. We understand that selecting a qualified Nanny childcare provider is one of the hardest choices a family will ever make. We also understand that parenting is not just a 9 to 5 job. That's why you'll have access to our Nanny Poppinz Call Center, where a Nanny Poppinz representative will be ready to assist you, 24 hours a day, 7 days a week (including holidays). At Nanny Poppinz, we care about our families and strive to make Nanny and family matches that will last as long as a lifetime. Let our local Charlotte Nanny Poppinz Agency help you find your perfect Nanny match today! To get started, click on the 'Families Click Here' link to complete a family application or call Nanny Poppinz . To show our appreciation for service to our country or community, we offer a special reduced Nanny referral fee to local military and law enforcement families. 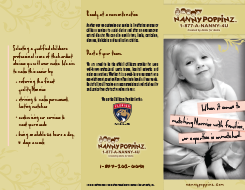 Nanny Poppinz provides corporate childcare and is the proud stadium Nanny childcare provider for the Miami Marlins, Miami Dolphins and Florida Panthers. Please call Nanny Poppinz for information. Prospective Nanny Poppinz Nannies should call Dasly at 954-899-3828 to schedule an interview. Proud Family Room Stadium Child Care Provider for the Miami Marlins, Miami Dolphins, and Florida Panthers.